Norway could set the global standard for helping refugees by bringing 1000 Rohingya to Norway for 6-months of food, shelter, and medical treatment. FILE PHOTO: Rohingya refugee camp in southern Bangladesh, August 2017. Image courtesy of Australian Broadcast Corporation. Of all the countries in the world that could get this right Norway is surely number one. If the Norwegian government, acting with one or more investor groups, built an apartment complex outside Bodø to hold 1000 Myanmar refugees complete with a recreation centre, an indoor swimming pool, an outdoor ice rink, a medical/dental clinic, some minor food and clothing stores tailored to the specific needs of the Rohingya refugees, and an auditorium (which could also serve as a basic schoolroom during weekdays) Norway could admit 1000 Rohingya refugees for a strictly time-limited 6 month period. Of course, after 6-months, those 1000 refugees would return to Myanmar or Bangladesh in much better health, with more education, and a better understanding about how Western society works. After a three week cleanup and repaint interval (as required by facility administrators and maintenance staff) a completely different set of 1000 refugees would arrive in Bodø and the process of helping Rohingya would begin anew. In effect, relatively small groups of Rohingya would spend 6 months away from (what is basically) Hell on Earth in Myanmar and southern Bangladesh — and thereby provide a minor boost to the Bodø economy. Yes, Norway would need to divert some of its foreign aid budget to building such facilities (Bodø construction companies would love that!) and provide the Rohingya with some minimal income to spend in Bodø stores (for those Rohingya who want to venture into the town) and some strong and able Rohingya men might want to volunteer for clearing Bodø sidewalks of snow in the winter, etc. and such volunteerism should be strongly encouraged by the administrators of the 1000-person complex. Their default mindset will thenceforth veer towards the obvious success story they witnessed in Norway, instead of being easily-led to disaster by the military strongmen and religious fanatics common in their home region. 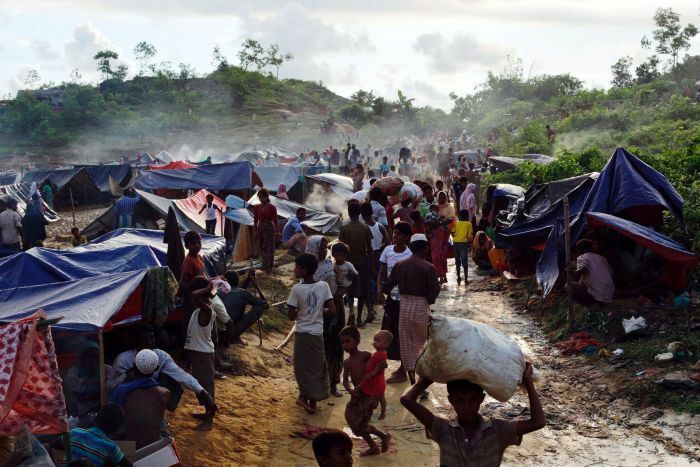 Norway can spend 20 million dollars (for example) to help the Rohingya encamped in squalor in southern Bangladesh where it will get very little value for that money — or it can spend 20 million dollars in the Bodø economy and help 2000 Rohingya per year, and thereby provide a significant benefit to the refugees and to the businesses of Bodø. By diverting $20 million from Norway’s annual foreign aid budget to help refugees (but helping them within Norway, instead of helping them in Myanmar or southern Bangladesh) 2000 Rohingya per year could receive excellent medical, psychological and dental care from Norwegian pre-med students, the refugees could have a rest from their deplorable living conditions, learn about the Western ‘Can Do’ mindset, experience an ultra-successful culture in Norway, learn about volunteerism — and return to their own region knowing that Norwegians care about them and those Rohingya will thenceforth find extremist archetypes far less appealing for the rest of their lives.